Happy 2012, and thanks to everyone who’s taken the time to rate my (and everyone else’s) entry. Also, if you can figure out why I apologize to Stephen King, Tweet at me and I’ll give you a prize. Blurry, stupidly sped up, and crazy alt tabbing so you can’t see anything. Enjoy. This is an effort of about 40+ hours total(I had party to go too and Mirage and I work at the same place so we had work as well). We got MisitfChris to make sounds and Music but we could not get them in. But we will be making an update if that’s allowed. We had to cut back and a lot of assets went without use. The game ends pretty quickly but I think we got the point across. – Programming using Love2D was fun! -Playing with the yarn ball is fun! -We lost our $6000 dollar Cheetos budget! -We had to cut our game practically in half because of time constraints. This was our first time participating and we had a blast! We are in for the next one! Go play it and tell us what you think! I didn’t have any basecode and started from scratch. 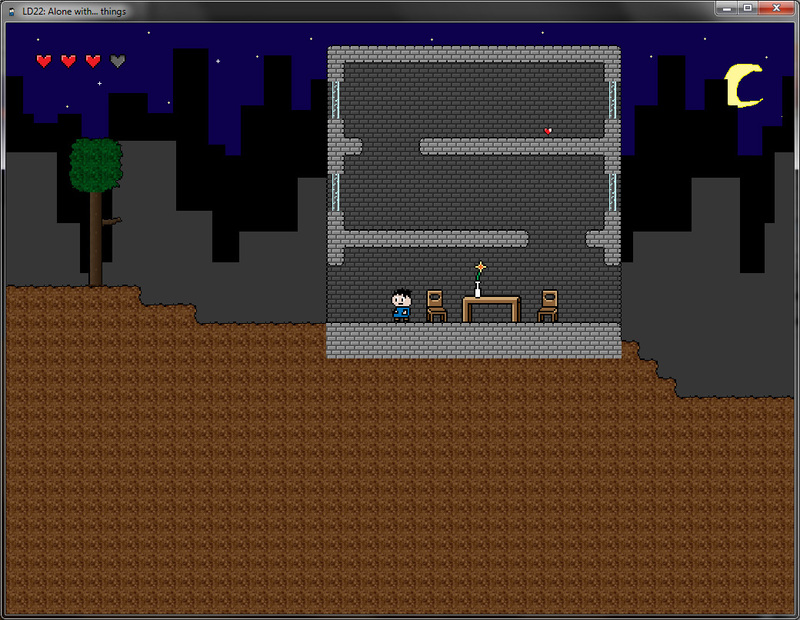 Thus a considerable amount of time was “wasted” on animation, landscape tiling and collision detection coding. The LD started at 3am here in Germany. I only got 4 hours sleep prior to the start and got unconcentrated and tired rather quickly. Coding went smooth like butter. I never really used XNA previously, but working with it is easy as long as you know the coding language well enough. I’m not much of an artist, but i’m happy with the art. Nothing fancy, but it works. Using bitmaps with 256 indexed colors for levels. You won’t need a level editor this way and adjustments can easily be made. XNA doesn’t support those, but the BMP format for color-indexed bitmaps is VERY easy to load directly from data. The game idea turned out to be interesting and fun. Combining a traditional gametype with some unconventional twist in gameplay seems like a good way to go. Sleep and eat well before and during the competion. You won’t be very creative or focussed when tired. Use a coding language and tools you are very familiar with. Use base code for animations and stuff. If you don’t have any participate in the warmup to create some base code for such things. Priorize planned features and keep the unessential untouched until you are done with the essential ones. Look at the themes during theme voting and try to come up with ideas for as many as possible. It helps to bring your creativity up to pace, even if a theme gets voted for which you haven’t got an idea yet. A drawing tablet (even a cheap one) helps A LOT with making art, even if you aren’t much of an artist and not good at drawing on paper. Take time to configure it and its buttons well for a smooth workflow prior to the contest. Ok, all basic mechanics are in place. I’ve decided to remove a few stuff in the end, but it’s for the better. The shield mechanic is now in place and it is the main attraction as o now. Dashing and Shielding are now separated (Shift – Dash, Space – Shield) from one another for better control over the character. The Main Menu is in place, although it lacks a Background. I’ve also finished the 1st level (easy), with 8 pits that warmly wait for the enemies to fall into them. Death cam and Victory cam have been added (camera zooms in on the player, and rotates). Gonna add a special kind of mood to both cams (dark/grey for death, something else for victory). I’m going to spend the next 4 hours adding more visual goodies (blur for dash, slow-mo camera when enemies fall into pit, a damage overlay for the player). After that I will try my best with sound and music. Time to get back to work, hence not much time is left, and more is needed to be done. As hilarious as this is, I’m fixing it now. 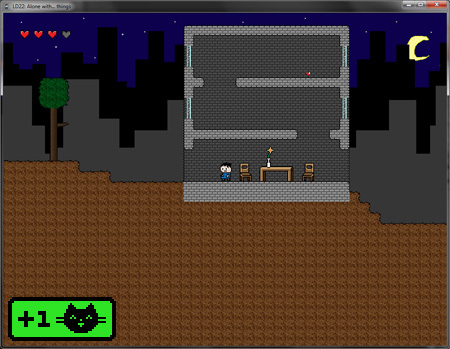 So far I have the basic code set up for the main character to allow for walking and jumping, and the camera is set to follow him. Now I’m going through and testing everything, and will be fixing anything that doesn’t work right. In the meantime, Alissa has been on an art roll! She’s finished all of the art for the main character, who has a different look for each level. Next, we’re going to be talking about the level design for our first level, and knock that out of the way. We’ve also got a pretty nifty little design doc, so we’re feeling pretty good about what we’ve got thus far. Still, it’s only day two and there’s so much more to do! Well, back to fixing that falling bug!